Love your designs! Thank you! Thank you for the free pattern! I’ve never made a cowl before, but I’d love to try yours. Also, your Gemstones Crocheted shawl is very lovely! Thank you very much! The cowl is pretty easy to do, and you will probably find yourself using that technique again. The Gemstones shawl is probably my favorite design at the moment. I’m really happy with how it came together, and I have my beautiful friend Patti as a model. You may have tried a little earlier than when the code was set to become active on Ravelry. Please try again as it should be working now! The only time I’m early hahaha. I did get it to work now though. Thank you so much!! I did find you because of the blog tour 🙂 After reading your recent blog posts, I have added you to my list of the few blogs to follow. I found your posts informative and easy to read. The blog tour has introduced me to a whole new world! Thank you for choosing to follow me! I hope you will continue to enjoy what is shared on the blog posts. I’m not commenting to win because I’m annoyingly allergic to wool, but I’m pleased you are on the blog tour as I really like your shawls. Thank you! If the random number generator does happen to choose you, I have a substitute yarn choice we can do. I found you on the Blog Tour. I will enjoy making the Behind The Ivy Cowl, thank you for the free pattern. I’m so glad to have discovered your work! I love your shawl designs and I’m very glad to see more gorgeous and glamorous pieces for plus-size ladies!! Thanks and keep up the great work!! You can always make it in Cardinals colors 😉 I’m sure it would look great either way. Laura, thank you so much for being part of the 2015 Crochetville Designer Blog Tour. I’m so glad people are discovering your wonderful blog! I also love working with lightweight yarns, I always feel the outcome is more elegant, even though it might take much more time to finish! Keep up he beautiful work! Thank you (and happy birthday to your mother)! The blog tour has been great as it has introduced me to several new-to-me designers. I found you through the blog tour, nice Ivy cowl. I must go off and crochet now. Thanks for the cowl pattern! It looks very warm and cozy. 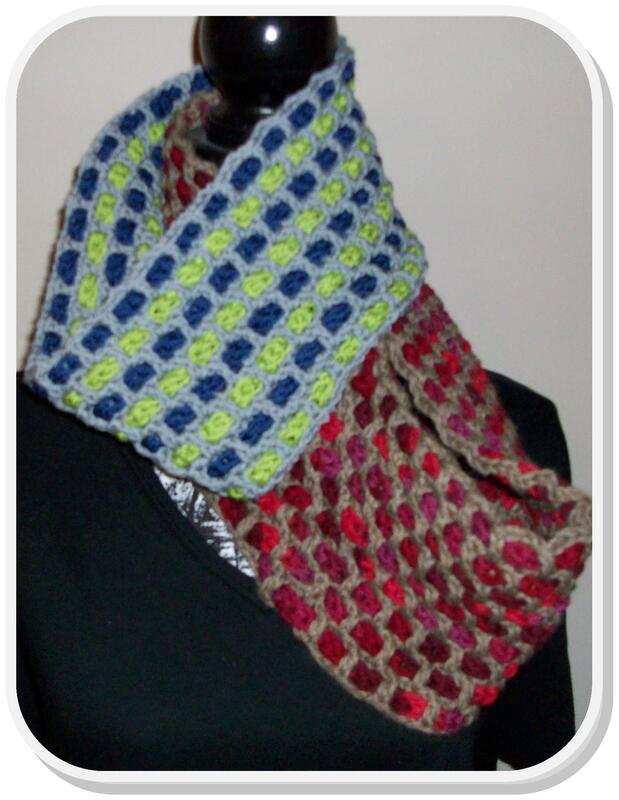 Your shawls on the Crochetville blog are gorgeous! Thanks for the cowl pattern! I’m glad to know about your shawl patterns also. So far my crochet experience has been limited to blankets… which turn out super thick and heavy because I crochet tightly! I’m still learning though, and reading about you today gave me hope that I can continue to improve, and even foray into things other than human burrito wrappers! 🙂 The cowl is ah-mazing… and as far as the piece from Crochetville, I’m glad I’m not the only one who sees motifs and thinks about putting them together! Def will be visiting again! I love your creations! Thank you for the freebie on Ravelry. Thank you for the pattern (found through the NatCroMo tour). I’m amazed at how different those cowl samples look based on the color of the yarn. Both look great! You have wonderful patterns! I found you through the NatCroMo Tour. I love the Tangiers Wildflower Shawl. That will be next to make on my projects list. Thank you for sharing your yarn journey with me. Look forward to more of your patterns to come. Wow! what a beautiful cowl! Thanks! Thanks for the free pattern – cowls are my favorite accessories!! Thank you very much for the free pattern. I am totally in love with your Gemstones Shawl. I don’t wear shawls but I have a friend who does and she would go crazy if I made it for her (I jut might as a gift). I enjoyed reading your blog post. I love your designs & color choices, I look forward to seeing more of your designs! Thank you for sharing.